Enjoy the ultimate race day experience at Ascot Racecourse with our luxurious private Ascot Hospitality Box for all major Flat and National Hunt horse racing fixtures. 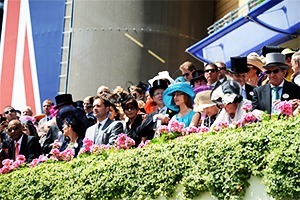 Throughout the year Ascot hosts some of the biggest meetings and fixtures in both codes of horse racing and a private grandstand corporate hospitality box allows you to see all the action, while enjoying the very best hospitality experience at this iconic racecourse. Whether it’s the fabulous QIPCO Champions Day, Christmas Racing Weekend or Royal Ascot you are guaranteed a truly unforgettable experience with the Ascot Grandstand Hospitality Box. This is the perfect way to entertain your valued clients and guests in a private environment, allowing you to enjoy first-class hospitality and world-class racing action. Major Racedays 2019 Treat your esteemed clients and guests to a day of luxury with our palatial Ascot Hospitality Box. Ascot Racecourse will once again host the biggest meetings in both National Hunt and Flat Racing in 2019, attracting racing enthusiasts from across the globe. The sumptuous level two box provides guests with stunning views of the action at Ascot Racecourse coupled with the finest VIP experience. Make it a race day to savour at this idyllic corporate hospitality setting. Eventmasters are delighted to offer you the chance to enjoy a truly luxurious Ascot hospitality experience with our Level Two Grandstand Hospitality Box. During 2019 Ascot Racecourse will once again host some of the biggest horse racing events in the country, with the best horses from both flat and National Hunt Racing competing at the iconic Berkshire venue. Our luxurious hospitality box provides you with an exclusive environment to entertain your valued clients and guests. Allowing you to enjoy an unforgettable day, which truly provides the wow factor. Locate on Level Two (which is the same as Royal Box level) you are guaranteed unrivalled views of all the horse racing action along with the finest quality hospitality available at Ascot Racecourse. Some of the major meetings at Ascot Racecourse include Clarence House Chase Day, Ascot Chase Day and of course the legendary Royal Ascot meeting – the pinnacle of the British flat racing season. Clarence House Chase Day is one of the biggest meetings of the National Hunt Racing season and 2019 promises to provide more thrilling high-speed jumps action. The Grade One Chase is run over a distance of two-miles and is one of the key trial races for the Cheltenham Festival. Six horses have won both the Clarence House Chase and Queen Mother Champion Chase in the same season outlining the quality of the race. The last horse to complete the prestigious double was Dodging Bullets in 2015 with other notable Clarence Chase heroes including Sprinter Sacre, Master Minded and Viking Flagship. The Ascot Chase is another major National Hunt event the Grade One race is always a brilliant contest. Since its first running in 1995 it has been won by a series of top-class performers including Silviniaco Conti, Cue Card, Riverside Theatre and dual-Cheltenham Gold Cup hero Kauto Star. Royal Ascot is the highlight of the calendar each year, with the very best horses from around the world competing across five days of glorious action – featuring eight Group One events. Everything about Royal Ascot exudes style and class; with the fabulous Royal Procession starting everyday before guests enjoy the finest racing and hospitality. These are just a taster of the meetings you can enjoy in 2019 with our fantastic Ascot Hospitality Box.